The title of this article is ambiguous. 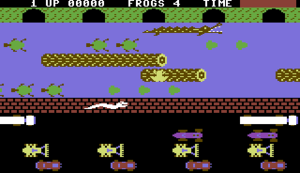 Frogger (Disambiguation). 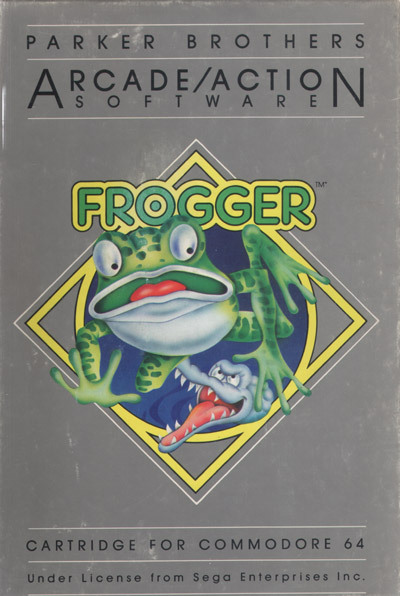 Information Follower: Frogger II: ThreeeDeep! 6.67 points at 21 votes (rank 450). 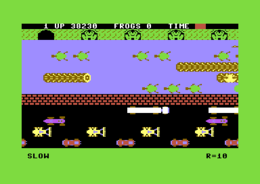 In the game Frogger you have to let frogs hop over a street with much traffic and over logs and turtles in a floating stream to one of the five free spaces at the upper rim of the screen. Dangers are always there: Cars drive over the frog and he does also not survive leaving the screen or jumping into water, and so on. Each frog needs to reach its aim within a given time. The time that is left is added to your score. When all 5 places are occupied, the next level starts. In higher levels the traffice gets more. Crossing the stream is aggravated by missing logs, submerging turtles and other small scurvinesses as crocodiles, water snakes and beavers. Furthermore, the available time is shortened and the speed rises. There are bonus points when pinching flies and the toad. 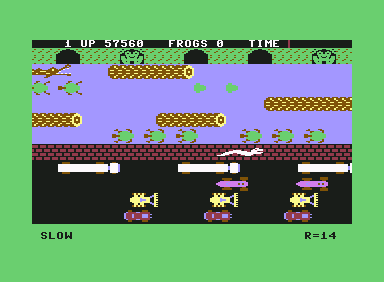 The game always shows the same background, in which in the lower parts move animated cars on the street and in the upper part in the stream animated logs, turtles, crocodiles, water snakes and the frog itself. There are music jingles at the start and end of each level. In between simple sound effects are played. Do not jump onto the mouth of an alligator (only on the back)! Do not jump into a cave in which there is an alligator! If you jump into a cave in which a fly sits, this gets you extra points (200 points). Collecting and then "bringing home" a green female frog sitting on a log also gets you bonus points (200 points). Werner: "The Parker version is at the beginning a bit more difficult than the Sierra version, as the speed is a bit higher and the goal needs to be hit more precise. Unfortunately, the game gets in the mode "Slow" surprisingly easier again from level 5 or 6! and with this more boring. Therefore only 6.5 points." 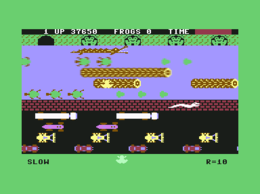 Frogger in the Killer List Of Videogames. This page was last modified on 27 September 2017, at 04:09.